This NOAA Fisheries video features spectacular underwater footage of octopus swimming and eggs hatching. NOAA researcher Liz Conners of the Alaska Fisheries Science Center points out the challenges of managing the Pacific octopus in Alaska and how researchers are working to develop new technology to better capture, tag, and study the octopus. The research study is a collaborative effort among the North Pacific Research Board, NOAA’s Alaska Fisheries Science Center, the University of Alaska Fairbanks, and the Alaska fishing community. Learn more about the Pacific Giant Octopus here. 1. 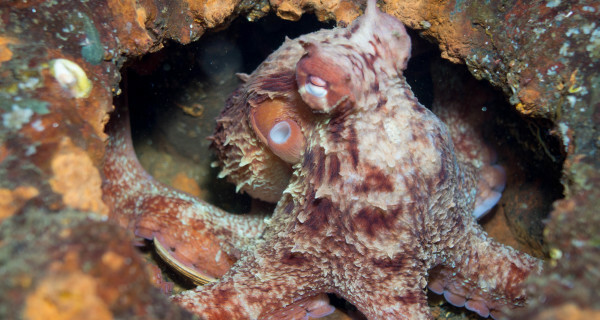 A 50-pound octopus can squeeze through a hole only 2 inches in diameter. If their beak fits, they can get through. 2. They are about 90 percent muscle. 3. You can tell a male octopus from a female by looking at the tip of its third arm on the right (starting between the eyes and going clockwise). Males have a special tip on this arm that has no suckers on the last few inches. This specialized tip is visible even in immature octopus. To mate, the male inserts this special arm into the female’s body cavity. A captured male will try to protect this arm. 4. Female octopus can wait until months after mating to fertilize the eggs. 5. An average female Giant Pacific Octopus in Alaska can lay 90,000 eggs. 6. Fishermen like to cut off the tip of an octopus’ arm and use it for halibut bait because it continues to wiggle even after being cut off. 7. Octopus frequently lose an arm to predators, but they grow back. 8. Giant Pacific Octopus are cannibals. They will happily kill and eat smaller octopus. 9. All species of octopus have venom. The venom of the Giant Pacific Octopus is not dangerous to humans, but Australia’s blue-ringed octopus is known as one of the most poisonous marine animals—its venom is deadly to humans. 10. Octopus actually have shells similar to clams and snails. There is a pair of small, spike-shaped structures called stylets inside the octopus’ body that are a vestigial shell—meaning it really has no function. 11. It is tempting to use “octopi” as the plural of “octopus”, but DON’T DO IT. “Octopi” would be a proper Latin plural, but the word “octopus” has a Greek, rather than a Latin, root. The correct use is to use the word “octopus” to refer to one or several individuals of a single species; use the plural “octopuses” only when talking about multiple species. 12. An octopus has three hearts, nine brains, and blue blood. Two hearts pump blood to the gills, while a third circulates it to the rest of the body. The nervous system includes a central brain and a large ganglion at the base of each arm which controls movement. Their blood contains the copper-rich protein hemocyanin, which is more efficient than hemoglobin for oxygen transport at very low temperatures and low oxygen concentrations.